If you can draw it, we can program and cut it! Modern CNC technology allows us to offer you more accurate, efficient and cost effective production, even on small runs. Curves, pocket cuts, or intricate shapes present no problem. Computer control offers you a level of consistency previously impossible with conventional cutting tools. We've equipped our router with two 10 HP Colombo spindles to double our output in any given time frame. The material capacity is up to 5 x 10 feet, which allows us to maximize yields on special materials. The benefits of this technology aren't limited to case building either. 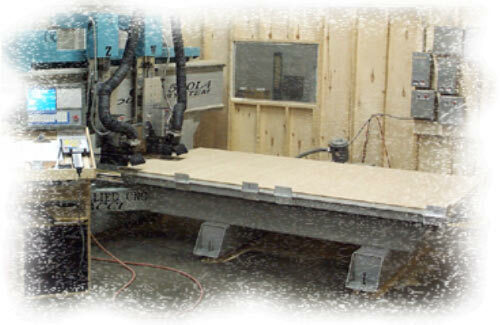 Furniture, signage, and speaker cabinets are just a few of the areas where CNC routers excel. Typical materials would include solid woods, plywoods, laminates (single or double sided), various plastics, particleboard or MDF. Or, if you prefer, we can custom cut parts or components from your own custom supplied material. The possibilities are virtually endless. Call or eMail Sales to discuss your particular requirements.